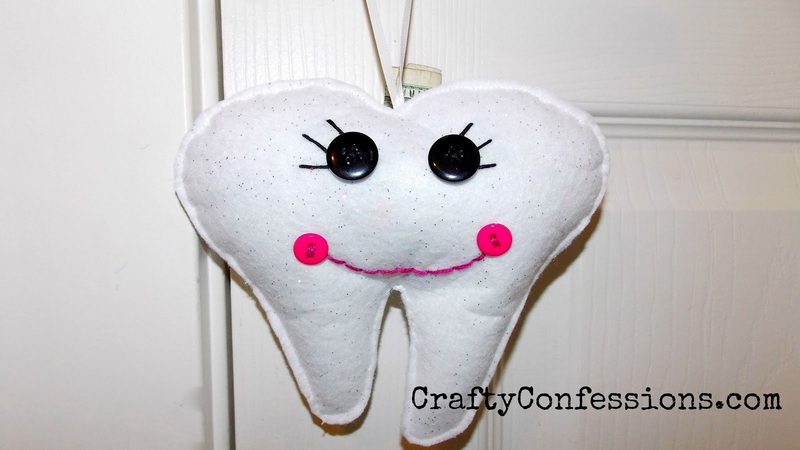 Miss Samantha has had a loose tooth for a few weeks now, and it became clear last night that I needed to make a Tooth Fairy pillow ASAP. 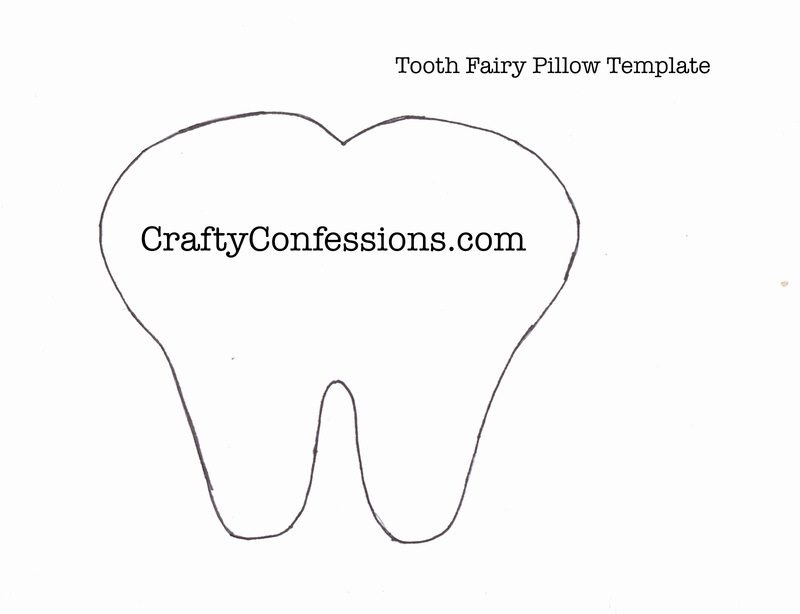 I have seen these cute little pillows on Pinterest, but none of the shapes were quite what I wanted, so I sketched out my own tooth template. It took a few tries to get it to look more like a tooth and less like angel wings, but I got it. 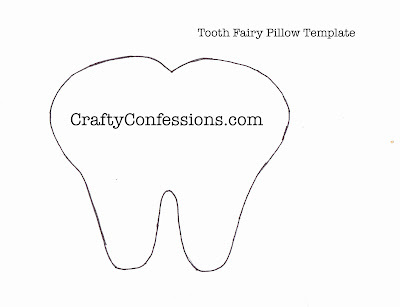 I've included my template and the instructions to you can make your own. First, let me say you can put this together using hot glue, or by sewing it together. It will look great either way, but I chose to use my sewing machine. 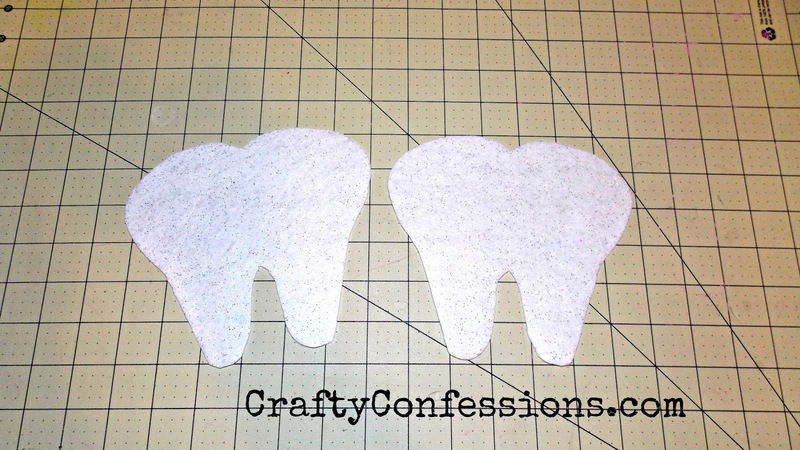 Pin the tooth template to the felt and cut it out. This will give you 2 teeth. Embroider the mouth on the front of the tooth and sew on your buttons. 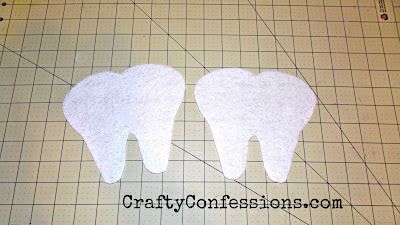 Cut out a small square or triangle of white felt and sew it on 3 sides to the back tooth. 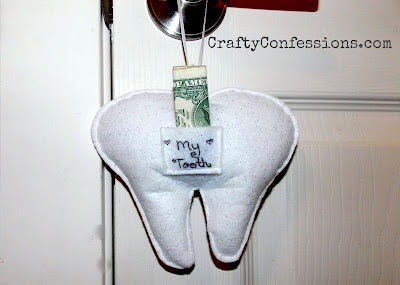 This will be your tooth/money pocket. Put your tooth panels wrong sides together and glue/sew around leaving enough room at the top center to add the stuffing. After you have added your stuffing make a loop with your ribbon and sew/glue the rest of the pillow with the ends of the ribbon the on the inside. If you don't want to hang your pillow you can just skip the ribbon. Now just wait for your munchkin to lose his or her tooth. Samantha's tooth fell out an hour after I finished making the pillow. Talk about good timing! Samantha loves her pillow and now all of her friends want one. It looks like I better buy more felt! Feeding my link party addiction with THESE great parties! What a great idea. 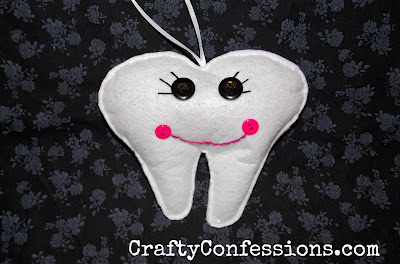 Our last tooth was left in a cup on the dresser. This is so much better! Thanks for the pattern, and thanks for linking up at my Felt Food Roundup on OneCreativeMommy.com. I hope you’ll be back for ideas when you're ready to make some more felt projects. we still have a long ways to go before my babies are losing teeth! but I love this and pinned it for when that day comes!! Glad I found this today! I've got my Kindergartener on the verge of losing his first tooth too. Better make one ASAP! Thanks! Very cute! 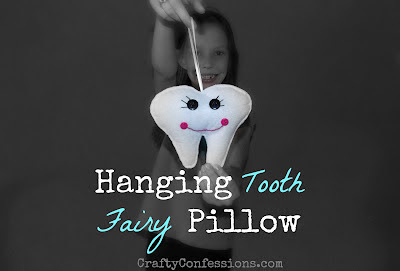 My son just lost his first tooth this week and the little white teddy bear tooth pillow we got when he was born seemed a bit too babyish for a 5 year old. Think I will try to make this for him instead! Found you at Happy Hour Projects!